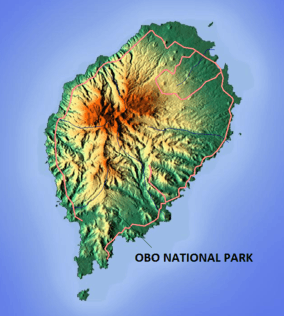 Obo Natural Park or Ôbo Natural Park (Portuguese: Parque Natural Ôbo) is a natural park of São Tomé and Príncipe, covering some 235 km² (30% of the island) of São Tomé Island in its south and 65 km² of Príncipe Island. Despite its name, it has the category of national park of the IUCN. The name etymology is of Angolan origin. The natural park was established in 2006 and is the country's only protected area. Pico Cão Grande is located in the southern-central part of the park on the island of Sao Tomé and rises dramatically in a needle-like shape over 300 metres (980 ft) above the surrounding terrain and the summit is 663 metres (2,175 ft) above sea level. The park is known internationally amongst conservationists for its biologically rich dense virgin rainforests. It is also characterized by a wide range of biotopes, from lowland and mountain forests, to mangroves and savanna area, which contribute to its unique ecosystem. The park includes virgin Atlantic high altitude rainforest and secondary rainforest (known to locals as capoeira) which contains abandoned plantations. In 1988, scientists classified the forests of São Tomé and Príncipe as the second most important in terms of biological interest out of 75 forests of Africa; most of the species found in the islands are found in the national park. The WWF has listed the forests of the national park as among the Global 200, the 200 most important biological areas on the planet and the forest of Obo is listed as an Important Bird Area (IBA) of Africa. The average annual rainfall is 2,493 millimetres (98.1 in). The park's altitude ranges between 0–1,973 metres (0–6,473 ft). The rainforests contain 100 unique orchids, and over 700 species of flora. The park's fauna includes the African manatee, as well as Newton's grassland frog, Sao Tomé giant treefrog, São Tomé Caecilian, Moller's gulf frog, and Peters' river frog., birds include the São Toméan grosbeak (Crithagra concolor), São Toméan ibis (Bostrychia bocagei), São Toméan shorttail (Amaurocichlia bocagei), the Giant sunbird (Dreptes thomensis and São Tomé thrush (Turdus olivaceofuscus)) and turtlles include the Leatherback sea turtle. On Príncipe island, they include a frog known as Phrynobatrachus dispar and a birds such as Dohrn's thrush-babbler (Horizorhinus dohrni) and the Príncipe thrush (Turdus xanthorhynchus), and the African grey parrot (Psittacus erithacus). 1 2 3 4 "Conservation history". Obo Park.com. Retrieved 10 November 2011. ↑ "Ôbo (São Tomé e Príncipe) - Area report". Retrieved 16 June 2013. ↑ United States. Naval Oceanographic Office (1969). Sailing directions for the southwest coast of Africa, from Cape Palmas to Cape of Good Hope. Retrieved 10 November 2011. 1 2 "Overview of Obo". European Commission Joint Research Centre. Oct 28, 2010. Retrieved 15 November 2011. ↑ "Tourist Attractions". Sao Tome and Principe Travel and Tourism. Retrieved 15 November 2011. ↑ Ham, Anthony (30 July 2010). Lonely Planet Africa. Lonely Planet. pp. 624–. ISBN 978-1-74104-988-6. Retrieved 15 November 2011.